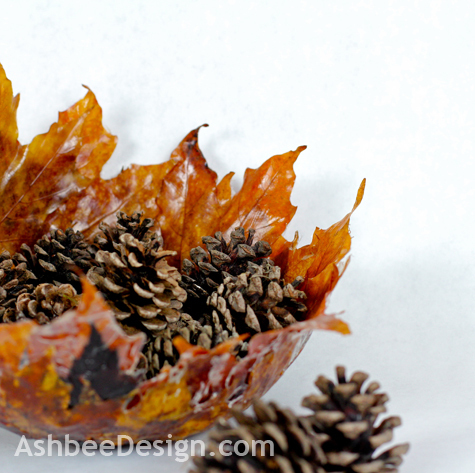 Ashbee Design: Pressed Leaves and Candles • A Pillar "Cuff"
I continue to explore ideas with the leaves I preserved from the magnificent fall crop this year. 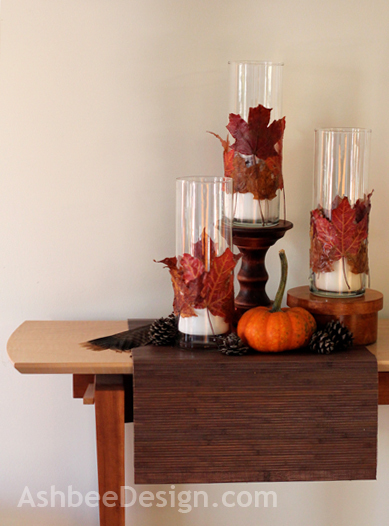 Over the last few days a made three leaf "cuffs" to go around my clear glass pillars with candles. I am very pleased with the results and have learned somethings along the way. Today, I'll share photos of the finished tablescape and tomorrow I'll post a detailed step-by-step tutorial. I had been inspired by this project from Martha Stewart but I wanted to modify it in a significant way. 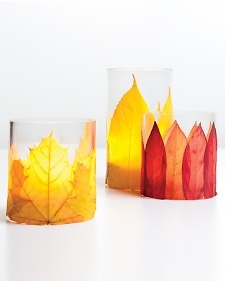 In Martha's project she glues the leaves directly to the glass pillars. I have one set of tall glass pillars and I use them throughout the year. 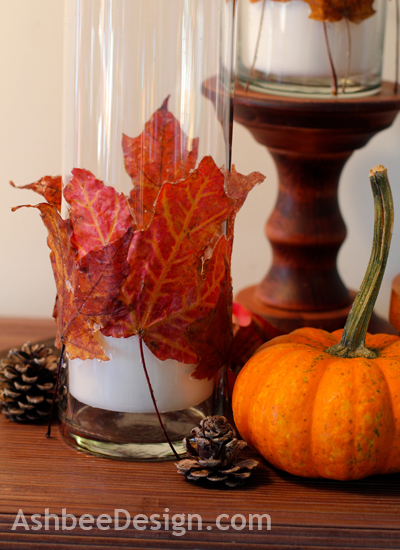 In Martha's project she glued the leaves directly to the glass pillars. I have one set of tall glass pillars and I use them throughout the year. 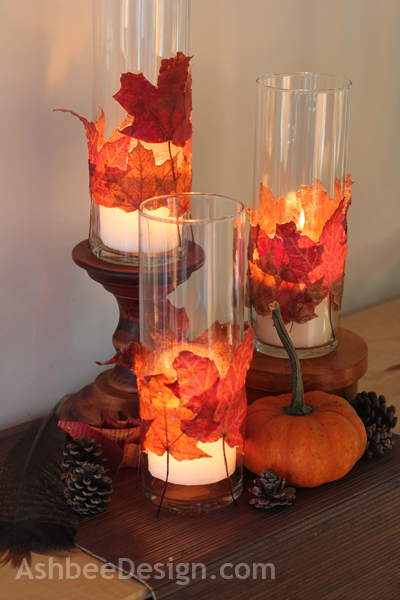 If I glue fall leaves onto them then I will need to buy a new trio when I want them for a spring tablescape. I decided to work on creating a leaf "cuff" that can slide on, or slide off, be saved and reused next year or replaced with a different seasonal theme. The important concept is that I only have to purchase (and store!) one set of clear cylinders. Using ModPodge and Saran wrap I have successfully made three cuffs that do indeed slide on and off. 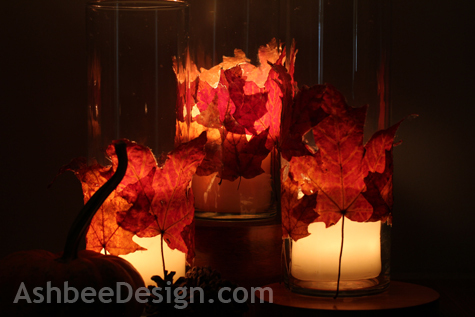 They are just a single ring of overlapping leaves so candle light shines through the foliage emphasizing the beautiful, rich autumn colors. The selection of leaves I used in this project came from leaves that I pressed. These retained more natural color than did the ones I soaked in glycerine. The glycerine ones I used in my leaf bowl and although they were less brittle, they had all mellowed to an amber color. The pressed leaves retained some reds although no yellows. I'll be setting three separate tables for Thanksgiving this year. 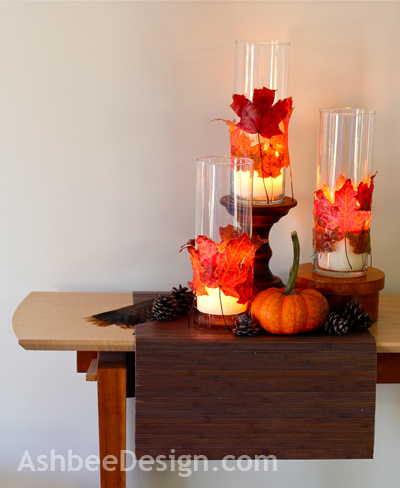 these candle pillars will definitely be the centerpiece on one. Come back tomorrow and I'll share the process and the lessons learned. Update: Here is the Tutorial!!! Love the idea of making a cuff! These are beautiful! Wow, too cool, they look great day or night! Very Clever! Thanks for sharing! Beautiful! I love the fact that it just slips on/off -- such a great cost and space saver! How pretty and festive for fall! Would love it if you linked up on my blog hop www.w-t-fab.com/search/label/bloghop. Also let me know if you'd like to follow each other!